He is a cutie pie! Happiest of World Cat Days to you all! He is for sure !!! Yes, I grew up with one, and he reminds me of Alfred! Oh a little cutie! This is killing me...don't tell SU or the tribe, but I'e always wanted a Siamesse. Is it really World Cat Day ? How did I miss that one ? I've always wanted a little Siamese, too. They're so adorable and wildly behaved. Perfect for my partner and me. But, we've filled our house with torties, instead - equally wildly behaved. Still, someday . . .
Ducky, you are so right about siamese & torties ~ we counsel visitors at the shelter about their behavior and independent streaks. We don't insist that new families have experience with these breeds/colors, but we do encourage them to do some research. 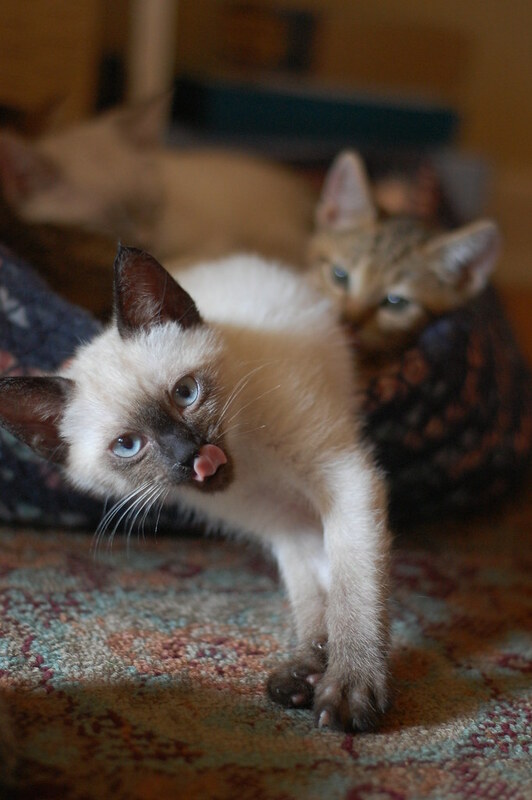 To top it off, we have a tortie point siamese in the cattery ~ good luck with that one! Ahh - he is one of my faves, for his sheer commitment to kneading. I bet he has a sweet 'tude to match. Is his voice a si-Meow?
" Why...do my itty bitty eyes decieve me ?" THE BISKINATOR !! ~ Yum." 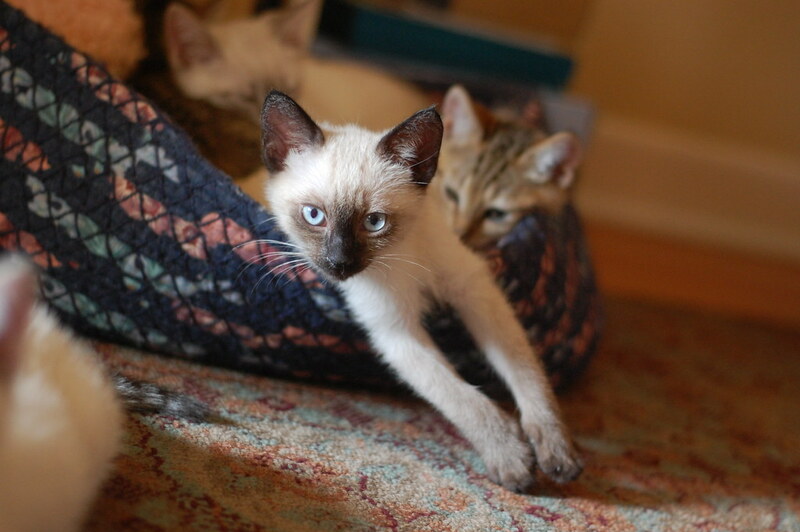 Whoever is adopting him is going to be very lucky to get a kitten with such a funny personality. What a goofball! We want updates on his antics at his new home! Shana, if I lived closer, I would be asking you about your tortie-point siamese! Lacey was full torti and Cagney is what I call a torti-tuxedo (with black tie to boot) - both unique personalities. Believe me - I've done - and loved - the research! Here's hoping that TortiPoint finds a perfect home! I would like to order a dozen of Signior Gaetano's Premium Italian Biscotti, please. I always joke that torties have extra personality because they're really two cats in one body.